It’s a sad feeling knowing Parks and Recreation won’t return back until may. So far this season, it has been consistently the funniest and best show not only on network television, but arguably on all of TV. On the bright side Community will return next week. But I don’t know why NBC will continue dragging out 30 Rock, which has become tremendously irritable since season 4, and The Office, which has been flagging since Carell’s departure. 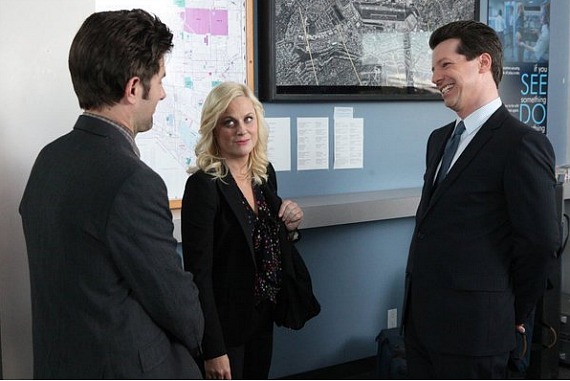 Thursday’s episode, “Lucky”, demonstrated Parks and Rec‘s usual charm, and was a strong and funny episode (it was written by Nick Offerman, who plays my favorite character on the show, Ron Swanson). The main part of the episode revolved around Leslie going to an interview with Buddy Wood (Sean Hayes, who will be in the upcoming The Three Stooges movie), who is described as the biggest and most famous interviewer in Indiana. A bump from Wood would give Leslie’s campaign for mayor a major boost, since the other five candidates Wood endorsed won their elections. Of course something had to go wrong. Leslie, Tom, and Ann, who are all tired of Ben’s strict campaigning schedule, decide to go out for a night of drinking when Ben tells them the interview’s been canceled, only to find out it’s been rescheduled. Not only did we get to see Leslie Knope do an interview drunk, but we also got to see the return of the hot tub limo. Parks and Rec is ussually at its peak when the characters try to fix their mistakes they inadverdently cause. One example is an earlier episode this season where Leslie invites a guy who says Leslie “isn’t the kind of person you wouldn’t want to bowl with” to bowl with her. The episode ends up with Ben punching the guy in the face after insulting Leslie. You’d expect Leslie’s polls to go down after that, but Leslie actually gains more support, appearing more tough to the voters. This episode’s title hints the ending which (spoiler’s alert) had Leslie’s interview with Wood be lost during the airplane ride. Leslie believes it was just a matter of luck, but we soon discover an airplane worker through away the tape to help Leslie’s campaign, showing how likable she is. At the same time, Andy finally passed his class on women’s studies (and shaved off his beard). He goes out for dinner to celebrate his P (for passing) with his teacher Linda (Danielle Bisutti), April, and Ron. April invites Chris to come (who is still lonely after being dumped by Jerry’s daughter, which April describes as sad), who tries to get Linda’s attention, only to lose out Ron. I liked seeing Andy’s reaction to passing Women’s Studies (which could have been used more), but I liked Chris better more when he was upbeat. I wouldn’t call this the best Parks and Rec episode this season (that still goes to the bowling one), but this probably enters my top five. Can April come any sooner?